Paul and I had no set plans for today. I was in charge of organizing the holiday but I left some days open for spontaneous activity. We didn't know where to go so we got some pamphlets from the hotel lobby. It’s always good to pick up a few travel brochures as you may discover an interesting but lesser known attractions. We decided to go to Coffee Works, a coffee emporium and museum. 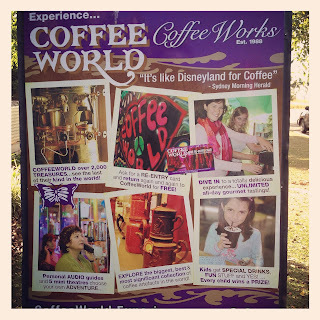 The brochure had a tagline that said, ‘Coffee World… it’s like Disney Land for Coffee’ which we thought was hilarious so we had to go. 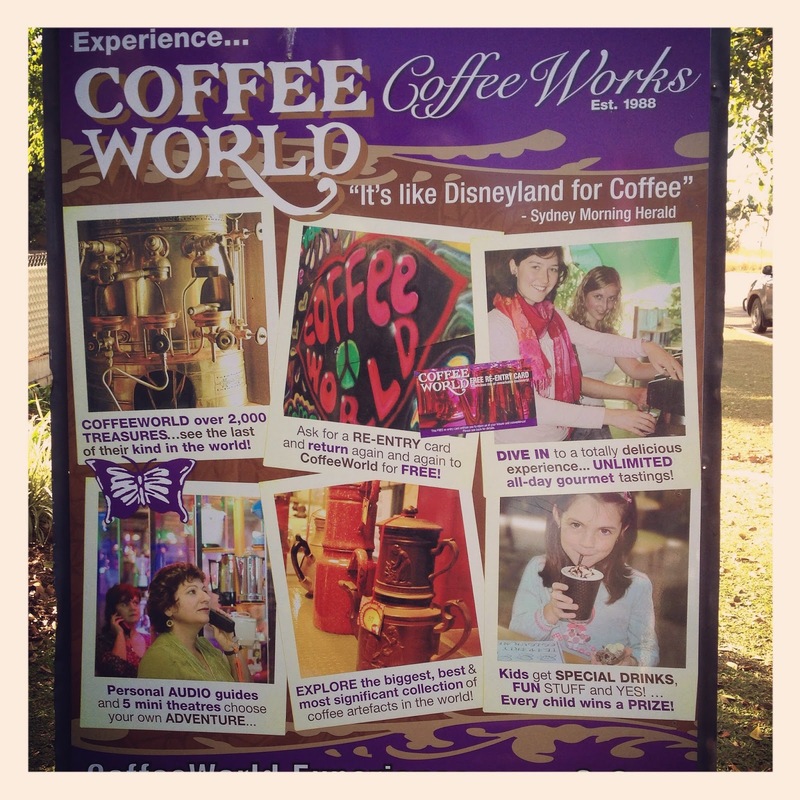 Coffee Works is located in Mareeba which is a one hour drive from Cairns. There is also a boutique in Cairns city for people who only want coffee. When we arrived at Coffee Works, we were delighted at abundance of trinkets, home furnishing and outdoor decorations that were on display through the entrance and gift shop. We had brought the Coffee Works brochure with us as it was written that if you bring it, you get a discount on admission. After we paid to get in, we were shown around the facilities. There was a room with heaps of coffee and tea dispensers and chocolate for tasting. Also, there was a museum with coffee machines from around the world. We decided to do the coffee tasting first and we were given cups to try whatever we liked. I decided to only take a sip of everything so I wouldn't become hyper from the caffeine. Paul couldn't drink much coffee because of his health so he mostly drank the teas. There were coffees from around the world, Swiss coffee, Ethiopian, Colombian, Indian, Mexican and all varying in strength. I found that the African coffees tended to be the strongest. I liked the hazelnut, Irish cream and vanilla flavoured coffees. I drank a few of the teas too but I can’t remember what I liked. There were also chocolates to try out such espresso, white, mocha and chilli chocolates. I like the chilli chocolate the most. After the tasting, we decided to head into the museum. At the start of the museum, there are interactive phones that you take while you walk around. Most of the displays have codes on them and you typed up the code on your phone and you could listen to a recording about information about that object. We had lunch after the museum and then left Coffee World for the next adventure.